The Centre is a not for profit neighbourhood house and adult community education centre, situated in Errol Street, North Melbourne. The Centre runs programs and activities that respond to the needs of the North and West Community to foster belonging, community spirit, reduce social dislocation and improve the well being of community members. The Centre is the producer of the annual Spanish Language Fiesta. The Spanish Language Fiesta offers a cultural and educational program based on music, food, dance, literature, art and activities for people from different ages and backgrounds. Resources are provided to the community to aid in practicing Spanish and engaging with Spanish and Latin American tradition through free, inclusive and family-focused activities. 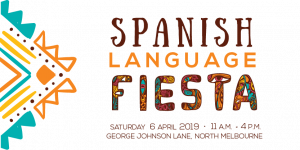 On Saturday 6th April 2019 George Johnson Lane, one of North Melbourne’s iconic laneways will come alive with activities aimed to educate our wider community about the rich traditions of Spanish language and it’s associated cultures. We would love for you to get involved and help the Fiesta be the best that it can be! Volunteers will be acknowledged through certificates of appreciation and we will provide reference letters on request. Volunteering is a great opportunity to meet people, give back to the community and gain experience in a high volume event. Please quote in application: Volunteering for the Spanish Language Fiesta via Pro Bono Australia.